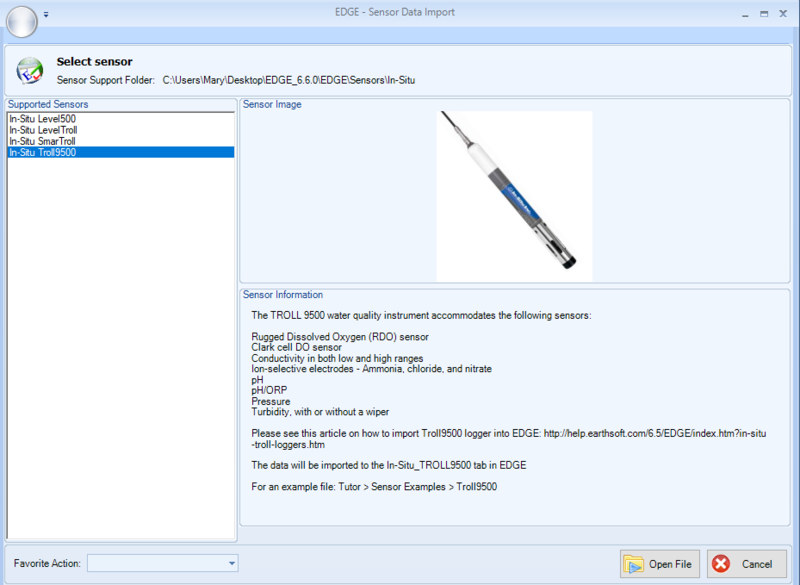 This article explains how to set up and import In-Situ Troll® 9500 data. To set up the remapping for TROLL 9500, a remap record with the code 'In-Situ_TROLL9500' must be created in RT_REMAP. 1.From the Application Menu, select Show/Hide Tabs. 2.The Tab Manager window will appear, check the In-Situ Troll 9500. The In-Situ Troll 9500 tab will appear in the tab selection list. 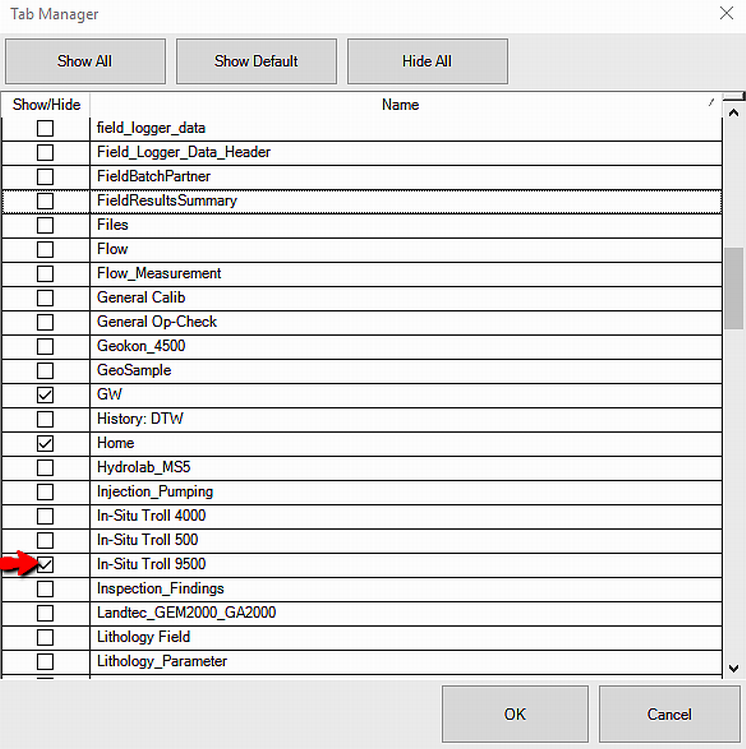 3.If the In-Situ tab is not available in the Tab Manager, go to the Configuration Plugin Tool and make the tab available, then repeat steps 1 and 2. 1.Select the Devices tab on the ribbon toolbar. 3.In the dialog that appears, select In-Situ Troll 9500. Note: In-Situ TROLL 9500 files need to be saved as *.txt. The following data and its units must be present in the In-Situ TROLL 9500 file in order for it to be imported into EDGE correctly. If "Well ID" is set in the In-Situ file, then EDGE will use this as the SYS_LOC_CODE and if this value is not set, it will default the SYS_LOC_CODE to the Test name value. Once the data has been imported, it will show within the In-Situ_TROLL 9500 tab. For the data to be imported within EQuIS, a sample record is required for each test that was performed. The sample recorded date and time must be after the date and time of the last reading for the In-Situ Test, and the In-Situ_TROLL 9500 file must be in Unicode text (*.txt) format. During the Create step in EDP and Enterprise EDP, a record will be created in DT_TEST and DT_RESULT for each value that is present within the In-Situ section. The import supports remapping of the CAS_RN and unit values to corresponding values within EQuIS.